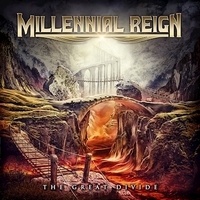 Millennial Reign is a power metal band from Arlington, Texas. The band was founded in 2010 and The Great Divide is their 3rd album, in the past this was the make-it-or-break-it album. From the original line-up only guitarist Dave Harvey is still active in Millennial Reign, the others joined in 2017 / 2018. A bombastic opener is the instrumental The Genesis and leads into Break The Tide, an symphonic power metal track. The basis is laid by drummer Steve Nichols and bassist Neil Bertrand and gives guitarist Dave Harvey the playground for his riffs and leads. On top singer Travis Wills is adding his emotional vocals including some high notes. But most of the time he uses a dark timbre which is very pleasant. At More Than Scars they add some symphonic elements to the neo-classical guitar play and vary in speed. Now Travis Wills is singing higher, which is fine, but the darker timbre just gives the band a more unique sound. Next in line Imagine, another fast one, but this time with a progressive edge, tempi changes and a catchy verse. With The Day The Sun Stood Still they hit a more traditional power metal area spiced up with symphonic elements. One of my favorites is Wounds In My Hand. The opening passage slightly reminds me of HIM, but then a song full of surprises develops into a mid-paced rocker with symphonic parts. And singer Travis Wills varies from dark tone to high notes, but is stronger when using the lower registers. They close this chapter with The Great Divide, another riff-based rocker. A decent album, but personally I would love to hear more darker vocals and a bit more variety in the songs. But that's just my personal taste. Anyway, I'm looking forward to hear more from the Texans.